This is a sweet holiday fantasy. Visiting a flooded Venice in November, an American tourist meets a handsome Italian chef. The story is very short – but so is Tom’s stay in Venice. An engineer at home, Tom admits that he is a fairly non-descript thirtysomething tourist. I found his typical American tourist habits pretty funny at times – Tom is nervous about the unfamiliar Italian food, he’s anxious about drinking too much, and he’s a little too worried about safety. If Tom is ordinary, half Japanese and half Italian Giovanni is a gorgeous fantasy. He is possibly a little too good to be true. I love the way he challenges Tom and teases him gently as he introduces him to his more relaxed European culture, his beautiful city, and his wonderful food. But Tom quickly recognises that Giovanni isn’t as fulfilled as he could be and he challenges him back. I felt that too much of this very short story was spent detailing Tom’s experiences as a tourist in Venice. Venice is gorgeous, but at times this story just lists a series of famous places or recounts all the ingredients in a meal. At the same time, there is limited character development and neither Tom or Giovanni ever becomes more than an American tourist or an Italian chef. The romance here is sweet and pretty low heat. This is a fantasy romance and Giovanni is an attentive and gentle fantasy hero. However, these two feel much older than they are supposed to be. Giovanni grew up in America so it isn’t a language barrier that makes them feel overly formal together. As the story covers less than a week in their lives, this was always going to be a happy for now (HFN) and the author somehow manages to make it a believable ending. This is a very short, but sweet story. We meet Tom, recently laid off from his job and taking an opportunity to revisit Venice, where he went as a teenager. This time alone, and there out of season, we get to know a lot about the tourist elements of Venice. He is a bit of a stereotypical American abroad I think, but it is quite entertaining. When Tom meets Giovanni (Gio), the chef in the pizzeria by his hotel, he makes a bit of a scene. But rather than shy away, he tries to make things right... and the two of them give their budding connection a chance. There is a twist in the tale at the end, which gives the reader the perfect chance to flex their imagination and fulfill their romantic requirements. 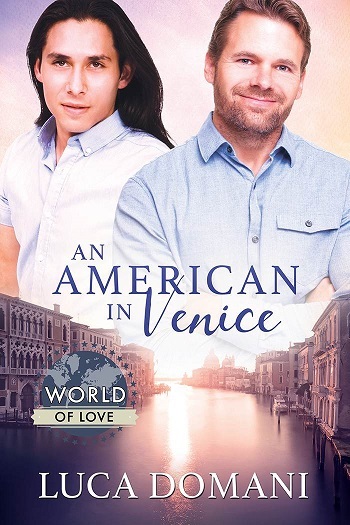 Reviewers on the Wicked Reads Review Team were provided a free copy of An American in Venice (World of Love) by Luca Domani to read and review.